You know how on December 26th or so you start thinking that you never want to eat food or drink alcohol again, like ever? I exercised a little more control than usual this year. It helped a lot that much of my family has adopted a paleo-ish style of eating. For example, for my sister’s college graduation dinner, which we also celebrated over the holidays, we had: lamb shanks braised in beef broth with fennel, carrots, and onions; julienned radishes cooked in butter; parsnip mash topped with the reduced braising juices and veggies; and kale with bacon, blackberry ginger balsamic vinegar, and pecans. It was a delicious and special meal that still felt good to eat. But then we followed it with tiramisu and White Russians and, well, you get the idea. On top of the holiday indulgences, I started getting infusions of a new treatment this week. I read that I should expect to feel very tired for a couple of days. I feel pretty good so far, but I already stocked the fridge with food for meals that Chris could prepare in case I couldn’t. 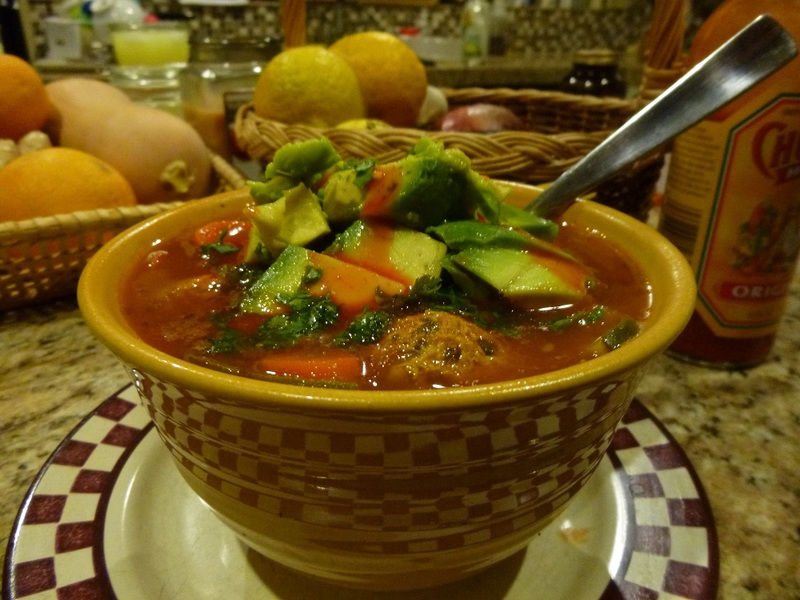 First up was one of our all-time favorite meals, a super-flavorful, veggie-packed albondigas (meatball) soup. 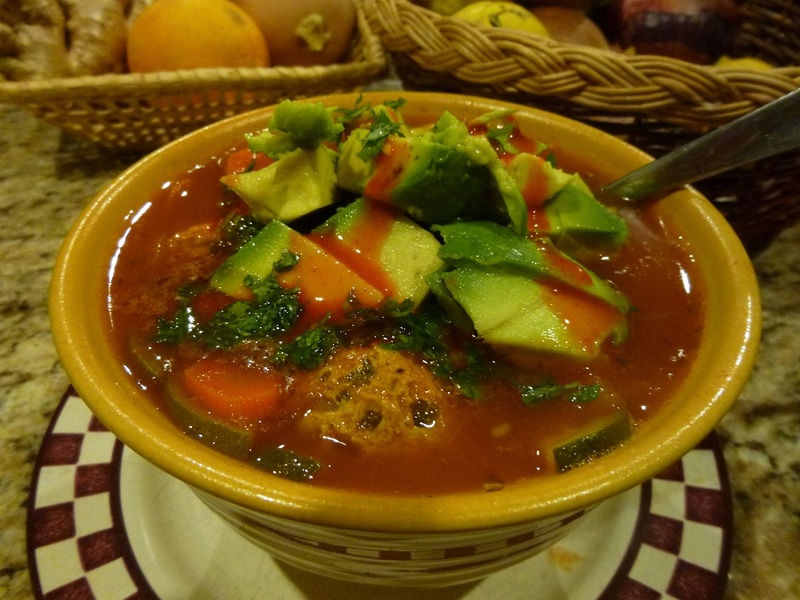 This soup is very adaptable to different dietary restrictions. For example, if nightshades are a problem for you, simply omit the tomatoes. You can also substitute plain ground meat for the chorizo, if chorizo is too spicy or if you can’t find one with acceptable ingredients, or switch out the summer squash for a winter squash or sweet potatoes. We’ve made this soup dozens of times–usually without a recipe and with whatever we have on hand. But the recipe I’m sharing here is our fave. And chopped up all the veggies. In the back left, I have the sliced squash. 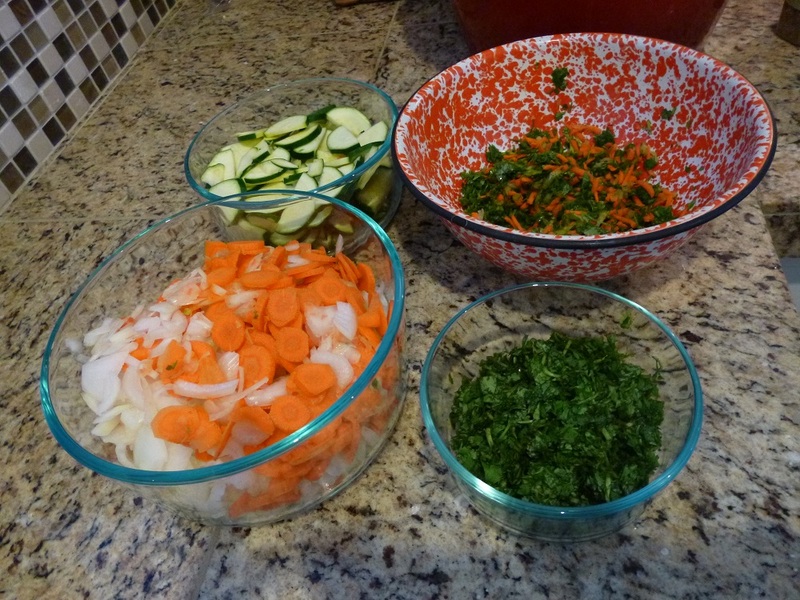 In the ugly orange bowl, I prepared all the veggies that will go into the meatballs. In the front left, you can see the mirepoix that will be cooked first. And in the last bowl, cilantro. You can do this ahead of time, too, to make dinner a breeze. Here is the final product. Buen provecho! Thinly slice 2 and 1/2 of the carrots and 2/3 of the onion. Set the rest of the carrot and onion aside for the meatballs. Heat 1 spoonful coconut oil over medium-high heat in a heavy stockpot. Add carrots, celery, and onion and saute for 4-5 minutes. 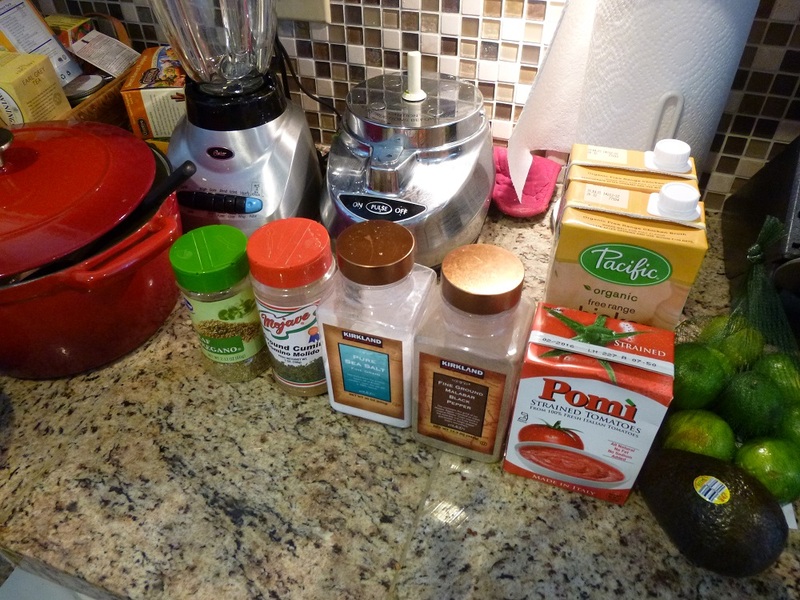 Sprinkle generously with cumin, oregano, salt, and pepper, and cook for another 1-2 minutes. Add broth and tomatoes to stockpot and bring to a boil. Meanwhile, make meatballs. Grate the leftover carrot and onion and combine in a bowl with half the finely chopped cilantro. Mix the vegetables with the ground meat and chorizo. Season lightly with salt and pepper (go very easy if you are using chorizo, since it is already seasoned). Roll into small meatballs, about 1 inch in diameter. When the broth boils, carefully drop in the meatballs and gently stir so they don’t stick together. Turn down the heat so it’s just barely boiling. Then let simmer for 20 minutes, until the meatballs are cooked. Add sliced squash to the soup and cook about 8 more minutes, until the squash are soft. Taste and adjust seasoning of broth. Serve in bowls topped with lime juice, diced avocado, fresh cilantro, and hot sauce to taste.